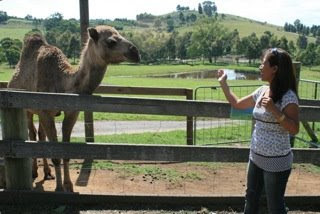 It was last Saturday when we went to the FairField City Farm (Sydney) to see some farm animals. Not only did the kids had a great time looking at the Australian animals but me as well. 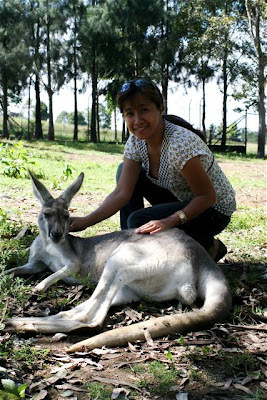 Although this is not the 1st time i have seen a kangaroo but still I just love having a picture with them. I was a bit scared when i tried to pat this native kangaroo bec. who knows it might kick me or somethin', but hey look i managed to go near it and touch it. They are gentle as long as you don't hurt them and that is why you are free to go near them, you can even feed them too. I have tons of photos but i just wanted to share these. Ahhh..... this camel scared me, it was walking towards me, I wanted to pat it but gosh, I didn't find the nerve hahahaha.. It was a nice day for all of us, we saw quite few animals like the camel, horse, kangaroo, wombats, lamb, goats and a lot more. This is a nice place for the family to go to see farm animals, have a picnic, or just laze around. Oh btw, there are many great places here in Australia that you can visit like the Opera House in Sydney, Blue Mountains, Hamilton Island, Gold Coast and lots lots more. You can get vacation deals now just in case you might want to book your next travel here. More photos to come !!! !